Israeli couscous, barley and flat leaf parsley combined with harissa and topped with diced roasted eggplant, tomato and purple cauliflower. Finish with shredded chicken and Sundried Tomato Vinaigrette. Combine the Hellmann's® Classics Salad Dressing Italian and sundried tomatoes. 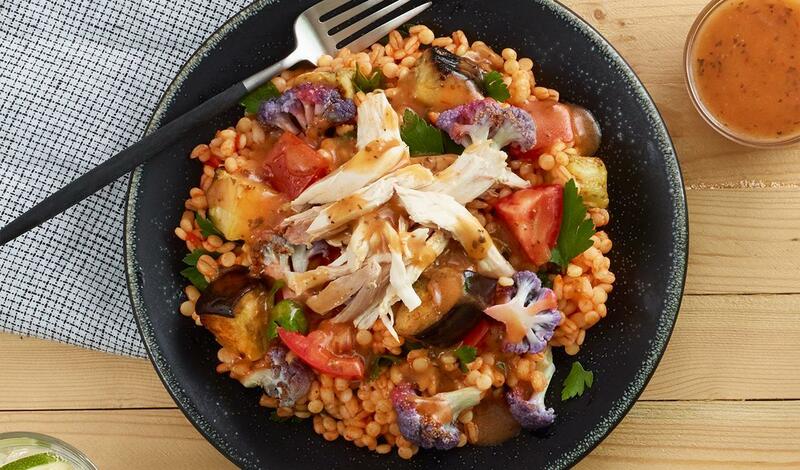 Combine couscous, barley, parsley and harissa, and top with eggplant, tomato, cauliflower, and shredded chicken. Drizzle with prepared vinaigrette.